Ms. Goodman is the Editor of History Musings. She has a BA in History & Art History & a Masters in Library and Information Studies from McGill University, and has done graduate work in history at Concordia University. Ms. Goodman has also contributed the overviews, and chronologies in History of American Presidential Elections, 1789-2008, 4th edition, edited by Gil Troy, Fred L. Israel, and Arthur Meier Schlesinger to be published by Facts on File, Inc. in late 2011. 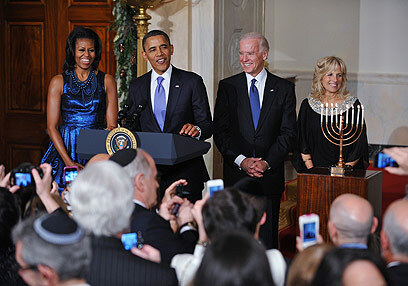 Obama, first lady Michelle Obama and Vice President Joe Biden convened a Hanukkah celebration at the White House Thursday in an early celebration of the Jewish Festival of Lights. Obama said the Hanukkah story was about “right over might, faith over doubt.” In the Hanukkah story, a small band of Jews rededicating a Jerusalem temple found that a one-day supply of oil kindled a flame instead for eight. Obama lights White House menorah at reception: President Obama hosted 550 people at the White House Chanukah reception. The annual event, held Thursday in Washington, was attended by the president and vice-president and their wives and attracted a mix of Jewish dignitaries from the political, community and cultural worlds. The president reiterated his “unshakable support” for Israel and noted that the festivities were being celebrated a week before the holiday begins. The West Point Jewish Chapel Choir performed at the event, while the menorah used was made in a displaced persons camp after World War II and donated by the Jewish Museum in New York. Obama celebrates Hanukkah in White House: President appears particularly jovial as he marks Jewish holiday earlier than usual. ‘The Hanukkah story is one of right over might, of faith over doubt,’ he saysUS President Barack Obama held a festive Hanukkah reception at the White House on Thursday and appeared to be in a particularly cheerful mood. Among the guests were his wife Michelle, Vice President Joe Biden, Israeli ambassador Michael Oren and Supreme Court Justice Ruth Bader Ginsburg. “The story of Hanukkah is one of right over might, of faith over doubt,” he remarked. 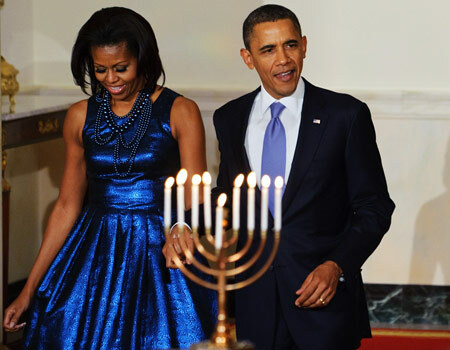 Michelle Obama is hostess for early Hanukkah party: It’s beginning to look a lot like Hannukah. Michelle Obama and her husband, along with Joe and Jill Biden, welcomed 550 guests last night to the White House to celebrate the Jewish holiday, even though it doesn’t start until Dec.20. “We’re jumping the gun just a little bit,” President Obama joked to the crowd, which included Supreme Court Justice Ruth Bader Ginsburg and ambassador to Israel Michael Oren. Obama fights for Jewish support amid GOP attacks: …Firing back, Democratic National Committee Chairwoman Debbie Wasserman Schultz called Romney’s comments “outrageous” and questioned his own policies. The White House cited military aid to Israel and support at the United Nations, and pointed to statements from Israeli officials backing up Obama’s assertion. The fiery debate will probably continue Wednesday when the GOP presidential candidates attend a Washington forum hosted by the Republican Jewish Coalition.